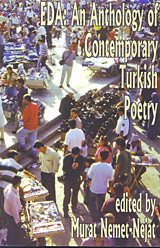 A selection of poems and essays drawn from Eda: An Anthology of Contemporary Turkish Poetry edited by Murat Nemet-Nejat, published by Talisman House, New Jersey, and available through Small Press Distribution. Read the sample of poems [»»] here. Read the essays [»»] here. Buy the book [»»] here!